Attention loyal Locavore fans! Here’s a great alternative to sitting around watching men in padded pants toss a weirdly-shaped ball around. How about spending Sunday, September 23rd at the New York Botanical Gardens? They’ve kindly given me two tickets to the Edible Garden Festival. What’s the Edible Garden Festival? It’s a celebration of the edible gardens they’ve been cultivating for the past six months (think Michelle Obama’s White House Garden, but closer). 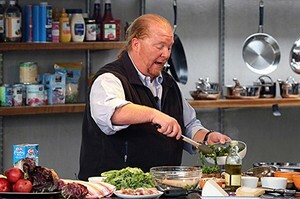 Your day – “a delectable day of culinary activities” – includes exploration of Mario Batali’s kitchen garden, cooking demos, recipes, food sampling, a cooking demo by Mario himself and an all-access pass to the NY Botanical Garden. While I can’t guarantee the weather, I’m sure you’ll have a great time and eat well! So how do you win these tickets? I will pick the reader who posts the best comment about: how much they love the Accidental Locavore, the NY Botanical Gardens, football, Mario Batali, or why you want to go. Bonus points will be given for liking the Accidental Locavore on Facebook, or following on Twitter (but you probably do that already). Comments must be posted by 10:00 EDT on Wednesday, September 19th and the winner will be picked and notified then. Enjoy!